Each new study shows podcast listenership increasing, and podcasts’ viability as a content marketing vehicle increasing right alongside. The most recent report (September, 2016) is from Tom Webster and Edison Research. It’s called the 2016 Podcast Advertising Study, and it’s based on the firm’s Infinite Dial series of reports on audio and “share of ear” trends. 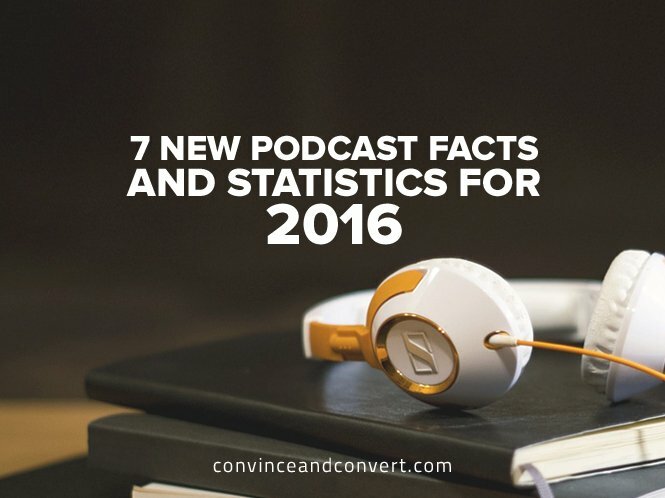 It extends research done earlier this year, that I summarized here: 5 Key 2016 Podcast Statistics. For the first time, awareness of podcasting has crossed the 50% threshold, and now stands at 55% among all Americans, 12 or older. 21% of Americans, 12 or older say they have listened to a podcast in the last month; a total of 57 million people. 71% of Americans now listen to podcast on phone or tablet. Note that in 2013, only 42% of podcasts were consumed on the go. This is an important shift because the multi-tasking opportunity of podcasts when mobile opens up more listening windows. Across the entire population, 28% of Americans say they follow companies and brands in social media. But among podcast listeners, 47% do so. 65% of podcast listeners are more willing to consider products and services after they learn about them on podcasts. 63% of podcast listeners say their opinion of a company is more positive when they hear it mentioned on a podcast to which they regularly listen. 45% of podcast listeners have visited a sponsors’ website. If you are interested in podcasts, we have five shows for you, including Social Pros, Content Pros, Business of Story, Influence Pros, and Convince & Convert (a podcast made from our best blog posts). Our team at Convince & Convert Media also produces podcast for several corporate clients. If we can help you, let us know via Contact Us.